New version 10.2 of Adobe Flash Player software has been made available recently by Adobe and it is recommended that you update your Flash Player to this newest version available. Including new versions of Flash Player, you can not only take advantage of security updates but also ensure superior performance on the web as Adobe Flash Player is considered to be the standard for delivering high-impact, rich Web content. Superior high definition (HD) video playback performance with hardware acceleration of video. Support for full screen mode with multiple monitors. Improved graphics performance and seamless composition with Internet Explorer 9 hardware accelerated rendering support. Improved performance and user experience enhancements enabled for developers with native custom mouse cursors. Latest bug fixes and security enhancement. Go to Flash Player Download Center and get the most recent version of Flash Player for your system. The update takes just under a minute and no restart is required. 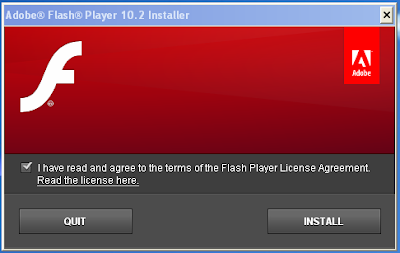 After downloading Adobe Flash Player installer, run it and in the screen that appears, agree to the terms of the Flash Player License Agreement and click Install. That’s it!! Installation is Complete.